When our suburban finally lurched to a stop at base camp, they were the first thing we saw: a dozen young men whooping, laughing, kicking the soccer ball—kids enjoying a match. The sun was setting, but that wasn’t a problem. They don’t mind playing in the dark. One young man polished his rifle off to the side, smiling and shaking his head as the others argued over whether or not the ball had gone out of bounds. We laughed and snapped photos, making excuses for why we couldn’t join in the match. We lived in this little community with these soldiers and our medical team for several days out in the desert. We’d only just arrived back in Baghdad when we heard the news: ISIS militants had attacked the base. Our doctors told us that four ISIS trucks approached the clinic from the east. 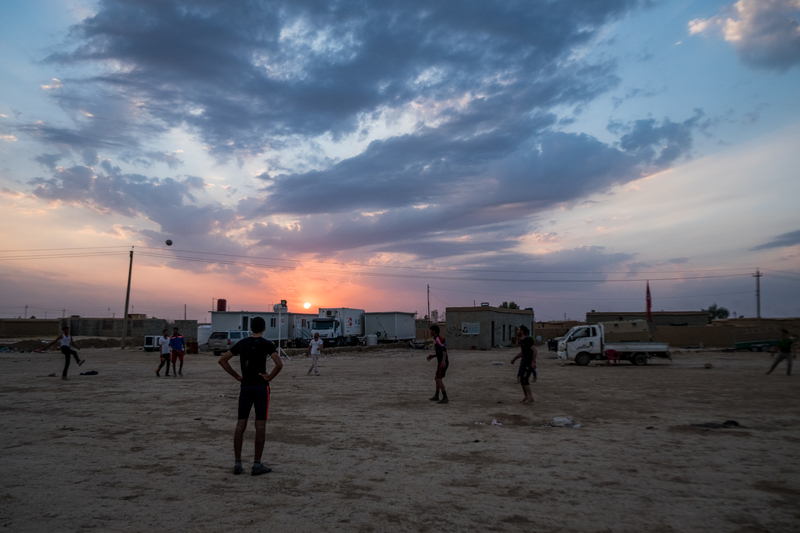 The fighting lasted multiple days, turning into a series of desert skirmishes involving an estimated 250 ISIS militants and several militia brigades, including the one we met playing soccer. Ultimately, Coalition airstrikes were called in and there were heavy casualties on both sides. Some of the ISIS militants are believed to have escaped, their whereabouts unknown. Among those killed were three of the men charged with protecting us. It is a sobering reminder. To all of you who chose to live and love on the frontlines, to give toward work in the wild badlands of Iraq and Syria each month, there is risk. These teams go knowing the risk. They know they may be pinned down for days under heavy fire—like they just were. But they keep going back again and again because this is what it means to wage peace. You don’t wage peace in the peaceful places, you wage peace in the war zones. You wage peace in the fire. The day after the smoke cleared and enshrouded bodies were lined up, our doctors were back at it, giving out vaccinations for children you helped provide. They didn’t hide in their trailers or demand to go home. They got back to work, serving people of a different faith, tribe, and ethnicity because they weren’t about to let a few differences or a little war get in the way of their love. So we remember the young men who gave their lives keeping us safe. We are thankful, and we honor their lives by pressing on, serving the very tribes who produced some of the ISIS fighters who killed them, because we know the violence can be unmade, the wrongness of the world will come untrue, and their sacrifice wasn’t in vain.